Yesterday we took the Evo Mini out for its first test drive. We braved the ice and snow and ventured into the city centre. As soon as we put Zach in the pushchair he fell asleep, must have been all the excitement! 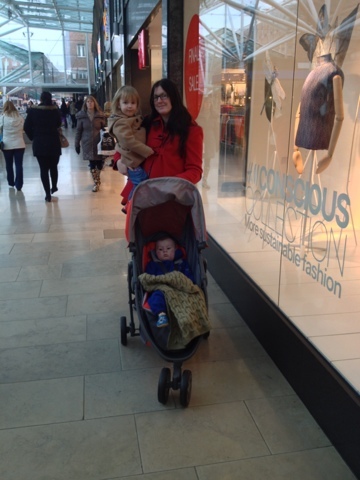 We started off in the shopping centre so I got to have a good feel at how the pushchair handles and wow! I couldn't believe how light it feels to push. Even with my big change bag on the back and Zach in the pushchair it felt like there was no weight to it. It is very easy to manoeuvre one handed if you have a toddlers hand to hold. I even tested the brakes out on a steep ramp from the car park and there was no moving it with the brakes on. My last stroller had awful brakes so was easily pleased by this! We then went outside where I could test it out on the icy paths. There was only a small amount of snow left on the ground so was more like slushy ice. My usual pushchair has big air wheels and glides through any amount of snow no problem so I was intrigued to see how the Evo Mini would manage snow. It was a lot better than I expected, the front wheel can be locked to make it easier in bad weather conditions. Although it wasn't as good as my Easywalker I was surprised to find I had no actual problems pushing through the snow except it felt slightly heavier than usual. After our first trip out I still love everything about the Evo Mini. I can really see the concept behind the Evo Mini being a 'mini pushchair' rather than a stroller. This week I have an exciting task planned to test out another of the Evo Mini's benefits. Here is a picture of me and the chunks enjoying our first trip out with the Evo Mini. It looks lovely! Looking forward to hearing more and finding out what special task you have planned!